This cabinet is one of four different sized cabinets in which to store selected Nature Inset Puzzles. These cabinets are so important in the classroom for storage space and to teach the child order as they replace the puzzles after use. Teachers can divide the puzzles into categories, e.g. 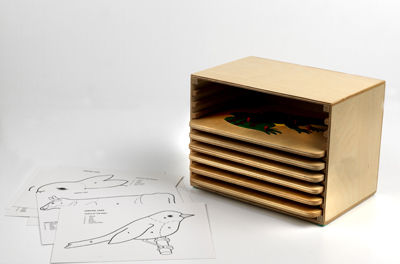 Nature, Animals, Plants...etc., or fill the cabinet with any nine of the separately sold puzzles.